It’s been barely a day since Mr Lee Kuan Yew’s death, but social media has already found the trolls lurking within our depths. While Singaporeans share tributes and post commemorative art, some people in Tanjong Pagar GRC are already calling for a by-election. Lee Kuan Yew had been the leading MP for Tanjong Pagar since its creation, and the constituency had remained uncontested until now. “Lee Kuan Yew is the longest serving MP in Tanjong Pagar GRC which has been unchallenged since its formation in 1991. Residents in Tanjong Pagar GRC needs a chance to elect a representative to represent their interest. However, Lee Kuan Yew has not attended a single Meet the People session since early 1990s or even longer. Commenters replied with angry and concerned comments, saying that the timing was not right. Others called for more respect for the man who had just passed. The page, however, seems to be deleting comments. 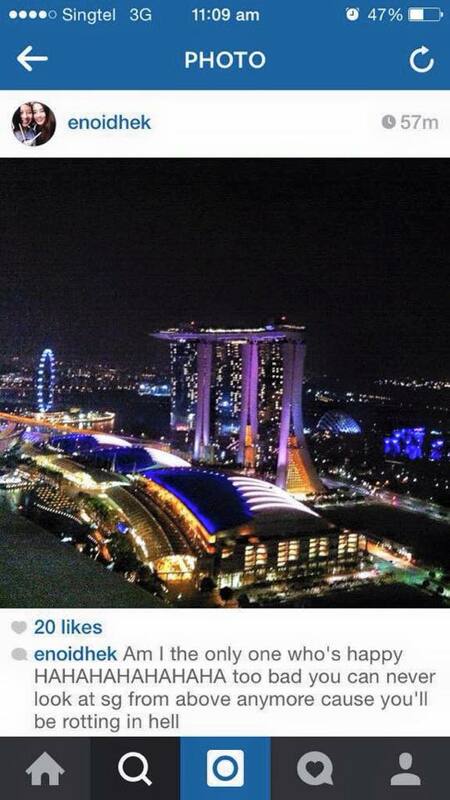 This is not the only post on social media that has incited the anger of Singaporeans. 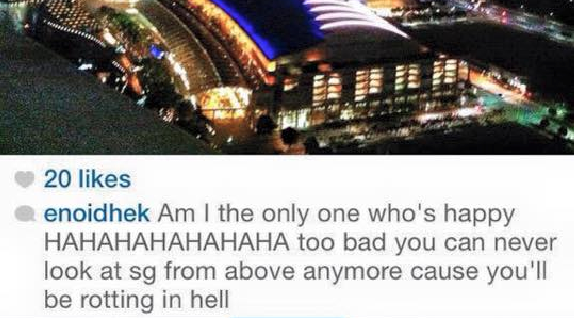 A screenshot of a post by Instagram user @enoidhek has been floating around Twitter and Facebook, with the caption “too bad you can never look at SG from above anymore cause you’ll be rotting in hell”. Even as commenters replied with anger or concern, she replied with, “Welcome to the world, where there should be freedom of speech (something which that someone did not let us have)”. The account has since become private. It is not a secret that Singapore has had its fair share of issues to deal with, and yes, the source of these issues could be traced back to Lee Kuan Yew’s leadership. But with the future ahead of us, it’s the perfect time for us to work through our problems in a constructive way, speaking with respect for people around us. 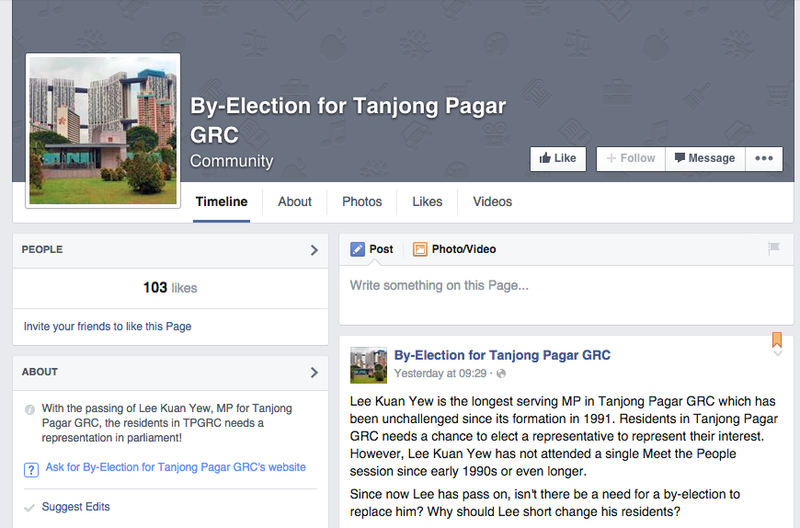 Some may agree that Tanjong Pagar is due for a By-Election, sure, but couldn’t it have waited another week? It’s true, some take it too far, lauding Lee with a god-like capability that no man deserves. Some would even say that the term “founding father” is debatable. While it is perfectly fine to disagree — or even dislike — any man, due respect should be paid to the family who has lost a loved one. And his family, in this case, is Singapore. And unless you’ve forgotten the Jover Chew incident, you should know how ruthless angry Singaporeans can be. Singaporeans, I know that we are a critical bunch. We are still struggling free from the ropes of press freedom, and may be tempted to act out in our frustrations and restlessness. But in all you do, remember to have respect and dignity in your social media dealings.